The third season of The O.C. commenced airing in the United States on September 8, 2005, concluded on May 18, 2006, and consisted of 25 episodes. The first ten episodes of season three aired Thursdays at 8:00 p.m. ET in the US on FOX, a terrestrial television network; however, from January 12, 2006 onwards, The O.C. was shifted to a later time of Thursdays at 9:00 p.m. ET. Following on from season two, the series continues to follow the characters' lives in the wealthy community of Newport Beach, Orange County, California, with the main characters entering their final year of high school. Series creator Josh Schwartz said he wanted to explore the characters moving away as he "didn't want to be one of the shows that stayed in high school too long". He added that "graduating from high school is such a sentimental moment for kids and parents. It's something we knew we wanted to mine and explore." The season revolves around Ryan Atwood's savior complex causing trouble, and Seth Cohen's lies posing problems in his relationship with Summer Roberts. Seth's mother Kirsten attends rehab in an attempt to put her life back together, while her husband Sandy assumes leadership of the Newport Group after Caleb Nichol's death and finds himself the heir-apparent to a legacy of scandal, and Marissa Cooper spirals out of control after her younger sister Kaitlin causes trouble on her return home from boarding school. The season was released on DVD as a seven disc boxed set under the title The O.C. : The Complete Third Season on October 24, 2006 by Warner Bros. Home Video. Season three was also broadcast outside of the United States. In Canada, the season was simulcast on the terrestrial network CTV Television Network. It was broadcast on Network Ten on Tuesdays at 8:30 p.m. (local time) in Australia, and premiered several months after it did in the US. In New Zealand the season started February 11, 2006 on TV NZ. It premiered in the United Kingdom on January 10, 2006 on the digital terrestrial channel E4, airing Tuesdays at 9:00 p.m. GMT. The episodes were rebroadcast the following week on the analogue Channel 4, E4's parent channel, on Sundays at 1:50 p.m. GMT. The season was produced by Warner Bros. Television and Wonderland Sound and Vision. The executive producers were series creator Josh Schwartz, McG, a co-founder of Wonderland, and Bob DeLaurentis. Stephanie Savage, the other co-founder of Wonderland, served as co-executive producer, whilst Ian Toynton served as supervising producer. The staff writers were Schwartz, Savage, DeLaurentis, John Stephens, J.J. Philbin and Mike Kelley. The regular directors throughout the season were Toynton, Michael Lange, Michael Fresco, Norman Buckley and Tony Wharmby. Season 3 cast; from left to right: Julie, Marissa, Sandy, Kirsten, Ryan, Seth and Summer. Autumn Reeser, who joined the cast as Taylor Townsend. The third season had star billing for seven major roles. Mischa Barton as Marissa, Rachel Bilson as Summer, Adam Brody as Seth, Melinda Clarke as Julie, Peter Gallagher as Sandy, Benjamin McKenzie as Ryan, and Kelly Rowan as Kirsten all returned to the main cast. Former main cast member Alan Dale did not return due to his character, Caleb, dying at the end of the second season, while Tate Donovan, as Jimmy Cooper, returned only in a recurring role, and then only for the first three episodes of the season. Logan Marshall-Green returned for the season premiere, portraying Trey Atwood, comatosed as a result of the shooting in the second-season finale. Additionally Navi Rawat, Samaire Armstrong, Daphne Ashbrook and Nikki Griffin all made brief returns to guest star as Theresa Diaz, Anna Stern, Dawn Atwood, and Jess Sathers, respectively. Willa Holland took over from Shailene Woodley in portraying Marissa's younger sister Kaitlin, who returns to the show after being away at boarding school last year. Cast member Michael Nouri continued as Summer's dad, Dr. Neil Roberts, who became a larger part of the series. Other actors to leave the series were Nicholas Gonzalez (D.J. ), Michael Cassidy (Zach), Shannon Lucio (Lindsay), Olivia Wilde (Alex), Billy Campbell (Carter), Kim Delaney (Rebecca), Johnny Messner (Lance), Kathleen York (Renee), and Marguerite Moreau (Reed). The season introduced a number of new students to the show. Additions to the cast included Autumn Reeser, Cam Gigandet, Ryan Donowho and Johnny Lewis, as new social chair Taylor Townsend, rival surfers Kevin Volchok and Johnny Harper, and Johnny's best friend Chili. Jeri Ryan and Jeff Hephner also joined the cast to portray new adult characters Charlotte Morgan, a mysterious woman Kirsten befriends in rehab, and Matt Ramsey, an overzealous business partner working at the Newport Group. New guest stars in recurring roles included Paula Trickey as Taylor's mother, Veronica Townsend; Erin Foster as a Newport Union student called Heather; Kayla Ewell and Nikki Reed as Johnny's girlfriend, Casey, and cousin Sadie; Eric Mabius as new Dean of Discipline, Jack Hess; Shaun Duke as Henry Griffin, head of the board at Newport Hospital; and Morena Baccarin as Griffin's daughter Maya. This is the final season for original cast member Mischa Barton who played Marissa Cooper; Marissa tragically dies in a car accident in the season finale. Season three was widely regarded by both fans and critics as the worst season of The O.C. The season premiere attracted 7.5 million viewers, but average viewing figures decreased twenty percent from the previous season to 5.6 million. The first half of the season averaged 6.3 million viewers, representing a substantial decrease in the show's popularity. However Marcy Ross, head of current programming at FOX said that the "ratings are perfectly fine and acceptable". After the eventual cancellation of the show, Schwartz admitted that "the whole first half of the third season was a total mess". The third season was nominated for five Teen Choice Awards and won four of them, including "Choice Drama/Action Adventure Show" and "Choice Actor: Drama/Action Adventure", which Adam Brody won for the third consecutive year. IGN faulted a season which, in their opinion, had "far too much time and too many episodes spent with the less than beloved character Johnny". IGN also noted that "Kirsten and Sandy both suffered from unsatisfying stories", and that the departure of character Caleb Nichol had been a mistake "as he had been a great character to bounce off both of the elder Cohens". In September 2007, Schwartz admitted in an interview for New York that the show "went down the wrong road" with Johnny. The season did, however, receive some praise. The new character Taylor Townsend was stated as being "played to perfection by Autumn Reeser" and her character was described as "one of the greatest elements of The O.C." Jeffrey Robinson of DVD Talk described the storylines as "very intelligent and also incorporate a great deal of humor to keep your interest". USA Today critic Robert Bianco said that the season premiere was "as dreary and ridiculous as any episode the show ever gave us", but the season finale was commended by IGN's Eric Goldman for killing off main character Marissa Cooper. Goldman said that "the episode documenting her demise was a fairly strong one" and that the following season "would really pay off this shocking twist". Despite not being the final season it was also noted that the graduation of characters gave "the show a feeling of ending". The Cohen, Atwood and Cooper family deal with Trey's shooting. Julie is determined to protect Marissa's future, even if it means destroying Ryan's. Kirsten meets another recovering alcoholic, while Sandy, Seth and Ryan deal with her absence at home. Sandy tries to encourage Kirsten to come home, but her friendship with Charlotte keeps her at rehab. The new Dean of Discipline determines Ryan and Marissa's fates at Harbor. Meanwhile, Summer is not pleased with Taylor Townsend arranging the school's Kick-Off carnival. Jimmy has an unexpected proposal for Julie. Sandy and Julie begin to interfere in Ryan and Marissa's relationship. Dean Hess threatens Seth and Summer with their lack of school spirit. Meanwhile, Caleb's will leaves the family in shock and Jimmy in trouble. This episode is named after an album by Don Henley. Marissa adapts to Newport Union, but Ryan is worried the separation will affect their relationship. Taylor schemes with Seth and Dean Hess' feud, but Summer finds a way to backfire. Meanwhile, Charlotte arrives in Newport with big plans for Kirsten. Sandy takes over the future of the Newport Group. Also, Julie may no longer be considered a Newport Beach socialite. This episode is named after an album by The Band. Sandy, Seth and Summer find a way to blackmail Dean Hess into letting Ryan back into Harbor. Meanwhile, Charlotte makes Julie an offer she can't refuse. This episode is named after the film of the same name. Taylor throws a Harbor event and plans to separate Seth and Summer. Ryan becomes concerned about Marissa's new life at Newport Union. Meanwhile, Sandy works on a plan for the Newport Group and forms a new partnership. Charlotte convinces Julie to involve Kirsten in her scheme. Marissa is determined to get Volchok to stay away from Ryan. Taylor begins to cause major rifts in Seth and Summer's relationship. Meanwhile, Sandy's new business partner goes above and beyond the call of duty. Charlotte is forced to leave town after Julie makes a bold move in their scheme. Ryan, Seth and Summer think about their future and start applying to colleges, while Marissa has other plans. Julie is forced to move into a trailer park and Kirsten is determined to help. Meanwhile, Sandy invites an old friend from UC Berkeley to dinner to inspire Ryan and Seth. Ryan takes an internship working for Sandy at the Newport Group, but he ends up working to save Matt's career. Summer and Seth are determined to get accepted into Brown. Johnny tells Marissa how he feels about her. Julie tries to adapt to her new living situation. Johnny's sudden misfortune forces him to take matters into his own hands, but Marissa and Ryan are determined to help. Kirsten reaches out to Julie about her living situation. Meanwhile, the holidays lead Summer to question Neil about her mother. Ryan, Seth, and Summer create a case to bring Marissa back to Harbor, much to Johnny's dismay; Sandy must make an ethical work decision that could influence the judge's verdict. Meanwhile, Neil and Julie are determined to tell their daughters what they've been hiding from them. Kaitlin Cooper returns to Newport, but brings trouble with her and asks Ryan for help. Meanwhile, Veronica Townsend requests a personal favor from Kirsten and threatens Marissa's future at Harbor. Marissa tries everything she can to rebuild her relationship with Kaitlin, who teaches Seth an alternative stress reliever. Sandy and Matt work together to secure a contract for the new hospital. Meanwhile, Julie is determined to bring her family together. Ryan confronts Marissa about their relationship when Kaitlin interferes with her friendship with Johnny. Seth confronts Summer about his Brown interview. Meanwhile, Kirsten and Julie take their dating service a little too far. Johnny's death brings a relative to Newport, who makes Ryan question his feelings for Marissa. Summer confronts Seth about the marijuana and his lies. Kaitlin returns to boarding school. Meanwhile, Kirsten and Julie throw a Valentine's Day party to promote NewMatch. Ryan and Sadie go on a road trip to find Johnny's dad, while Marissa's being investigated. Meanwhile, Seth and Summer discover Julie and Neil's secret relationship. Ryan struggles whether to invite Marissa to his birthday or not, while Sandy decides if he should invite one of Ryan's family members. Neil and Julie decide to tell Marissa and Summer about their relationship. Volchok tries to become involved in Marissa's life. An old nemesis returns to Newport, causing rifts in Ryan's new relationship with Sadie. Seth and Summer turn to Taylor when their relationship struggles Marissa finds herself all alone in Newport and spends the night with Volchok. Meanwhile, Sandy grapples with business pressure. Julie and Neil tell their daughters about their engagement; however, Marissa distances herself from Summer when she gets closer to Volchok. Ryan tries to move on with his relationship with Sadie. Meanwhile, Kirsten and Seth have a night out. At the Newport Group, Sandy has to deal with Matt's mishaps. Ryan and Sadie plan their future after high school, but their decision concerns Sandy and Kirsten. Marissa and Summer begin to rebuild their friendship. Meanwhile, the drama surrounding Sandy's job intensifies and seeps into the Cohen household. Ryan leaves Newport to invite Dawn to graduation, but hesitates. Summer and Taylor try to discover what Seth is hiding from them. Julie confronts Volchok about his relationship with Marissa. Meanwhile, Sandy begins to pay more attention to the Newport Group than his home life. Ryan and Marissa leave Newport to attend an orientation at UC Berkeley, while Seth visits Brown and sees a familiar face, to Summer's displeasure. Kirsten is surprised to see someone from the family's past at the airport, and turns to Sandy for support. Ryan invites Theresa to prom, while Marissa bring Volchok, who only causes trouble. Anna helps Seth rebuild his relationship with Summer. Meanwhile, Kirsten turns to Julie for support. Sandy finds trouble in the hospital development. Sandy and Seth confront each other about their recent behaviors. Volchok leads Ryan into trouble. Kirsten returns to some bad habits. Meanwhile, Marissa leaves Newport when Kaitlin calls for a favor. Marissa receives an unexpected proposal from Jimmy that may change her future plans. Dawn returns to Newport to support Ryan on his graduation, but Volchok's threat might make it hard. Seth comes clean about his recent behavior. Summer faces the prospect of going away without Seth. Meanwhile, Kaitlin returns to Newport and decides to enroll in Harbor, and Sandy yearns for a return to his old job. "Season 3 Episodes". CTV.ca. CTVglobemedia. Retrieved September 25, 2008. 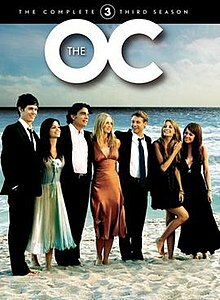 "The O.C. Season 3". Canadian Online Explorer. Quebecor Media. Retrieved September 29, 2008. ^ Adalian, Josef (December 20, 2005). "'OC' sees new slot amid Fox sked shakeup". Daily Variety. Reed Elsevier. Retrieved September 19, 2008. ^ a b c Oldenburg, Ann (December 14, 2005). "Graduation plans grip 'O.C.'". USA Today. Gannett Company. Retrieved September 26, 2008. ^ "The O.C.-The Complete Third Season". Warner Bros. Retrieved September 26, 2008. ^ "The O.C. - The Complete 3rd Season". TVShowsOnDVD.com. Archived from the original on October 1, 2008. Retrieved September 15, 2008. ^ Canadian Press (September 6, 2005). "Rowan looking forward to more turmoil on The OC". CTV.ca. CTVglobemedia. Retrieved September 26, 2008. ^ Ellis, Scott (July 24, 2006). "Dying to be dead". The Sydney Morning Herald. Fairfax Media. Retrieved September 26, 2008. ^ "Episode One: The Distance". TV NZ. Retrieved October 13, 2008. ^ Wilkes, Neil (December 31, 2005). "Special Edition: The Premiere List". Digital Spy. Hachette Filipacchi Médias. Retrieved September 26, 2008. ^ Fox: Press release (March 22, 2005). "Fox Orders Third Season of 'The O.C.'". The Futon Critic. Retrieved September 23, 2008. ^ a b Fox: Press release (November 9, 2005). "Fox Orders Third Season of 'The O.C.'". The Futon Critic. Retrieved September 24, 2008. ^ a b Acosta, Belinda (September 2, 2005). "TV Eye: 'The OC' effect". The Austin Chronicle. Nick Barbaro. Retrieved September 24, 2008. ^ a b "Backstage Pass: Episode Guide - "The Aftermath"". The O.C. Insider. Warner Bros. Retrieved September 24, 2008. ^ a b "Backstage Pass: Episode Guide - "The College Try"". The O.C. Insider. Warner Bros. Retrieved September 24, 2008. ^ "Daphne Ashbrook Resume". daphneashbrook.net. Daphne Ashbrook. Archived from the original on March 9, 2009. Retrieved September 24, 2008. ^ "Nikki Griffin: Credits". TV Guide. Retrieved September 24, 2008. ^ "Backstage Pass: Episode Guide - "The Road Warrior"". The O.C. Insider. Warner Bros. Retrieved September 24, 2008. ^ "Autumn Reeser - Bio". autumnreeser.com. Autumn Reeser. Retrieved September 25, 2008. ^ "Backstage Pass: Episode Guide - "The Anger Management"". The O.C. Insider. Warner Bros. Retrieved September 24, 2008. ^ Levine, Nick (March 2, 2008). "Picture Special: Boys from 'The O.C.'". Digital Spy. Hachette Filipacchi Médias. Retrieved September 24, 2008. ^ Chang, Justin (November 9, 2005). "Jeff Hephner". Daily Variety. Reed Elsevier. Retrieved September 25, 2008. ^ Keck, William (February 7, 2006). "'O.C.' girl doesn't back down". USA Today. Gannett Company. Retrieved September 26, 2008. ^ "Backstage Pass: Episode Guide - "The Shape of Things to Come"". The O.C. Insider. Warner Bros. Retrieved September 24, 2008. ^ a b c d Goldman, Eric (March 7, 2007). "The O.C. : Which Season Was Best?". IGN. Fox Interactive Media. Retrieved September 25, 2008. ^ "Series Primetime Wrap 2005–2006". The Hollywood Reporter. Nielsen Business Media. May 26, 2006. Retrieved September 25, 2008. ^ Moss, Corey (August 21, 2006). "Britney Introduces K-Fed, Nick Lachey Scores 'Awkward' Award At Teen Choice 2006". MTV.com. MTV Networks. Retrieved September 26, 2008. ^ Robinson, Jeffrey (November 14, 2006). "The O.C. - The Complete Third Season". DVD Talk. Internet Brands. Retrieved September 25, 2008. ^ Bianco, Robert (September 7, 2005). "What to watch Thursday". USA Today. Gannett Company. Retrieved September 26, 2008.